Aim: To investigate oral candidiasis in patients with head and neck cancer before and after intensity-modulated radiation therapy and three-dimensional conformal radiotherapy (3D CRT) and to explore if there is an association with the type of radiotherapy used and the severity of candidiasis. Materials and Methods: Patients who received radiation therapy (RT) for the treatment of head and neck cancer were divided into two groups: Group 1 consisted of patients (n = 20) who received Intensity modulated radiation therapy (IMRT) and Group 2 (n = 20) consisted of patients who received 3D CRT. Saliva from these patients was collected before and after radiotherapy and evaluated for Candida species using culture method. Results: Significant increase of Candida albicans was seen in patients who underwent 3D CRT as compared to IMRT. Other species of Candida such as Candida tropicalis, Candida glabrata, and Candida krusei showed increase postradiotherapy in both groups, but the change was not significant. Conclusion: Although candidiasis is seen regardless of the type of radiation therapy used, the oral environment is more stable after intensity-modulated radiation therapy as and when compared to 3D CRT. Salivary substitutes and good oral hygiene before, during, and after radiotherapy could be used to increase oral clearance and to decrease the chance of candidiasis. Aim: The aim is to determine the perception of pain and discomfort by the patient during the placement of orthodontic separators. Materials and Methods: Elastomeric separators were placed in randomly selected 100 patients for fixed orthodontic mechanotherapy. Visual analog scale was used to register the patient's pain perception during the placement of elastomeric separators and continued subsequently on 1st, 2nd, 3rd, 4th, and 5th day. Results: The data show 41.3% of urban and 53.7% of the rural population of the patients reported pain during the placement of separators. Until the 1st day, in the urban, 53.04% of patients and in the rural population, 48.15% of patients reported pain. In the urban population, 30.43% of patients and in the rural population, 25.93% consumed analgesics. Conclusion: The pain associated peaks within 4–48 hr from separator placement, and then declines to reach its lowest level on the 5th day. Since pain of moderate intensity occurs during the treatment, analgesics and soft food are recommended. Aim: The aim of this epidemiological study was to assess the prevalence of signs and symptoms of TMDs in Vidarbha population by Fonseca's questionnaire. 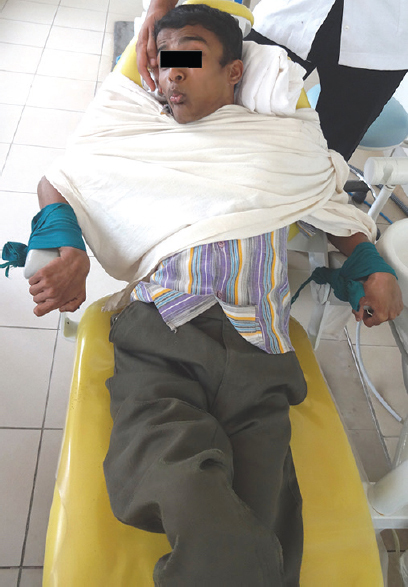 Materials and Methods: A group of 200 patients were randomly selected from the outpatients attending Swargiya Dadasaheb Kalmegh Smruti Dental College and Hospital. Each patient was provided with a questionnaire and points were given accordingly for each question. 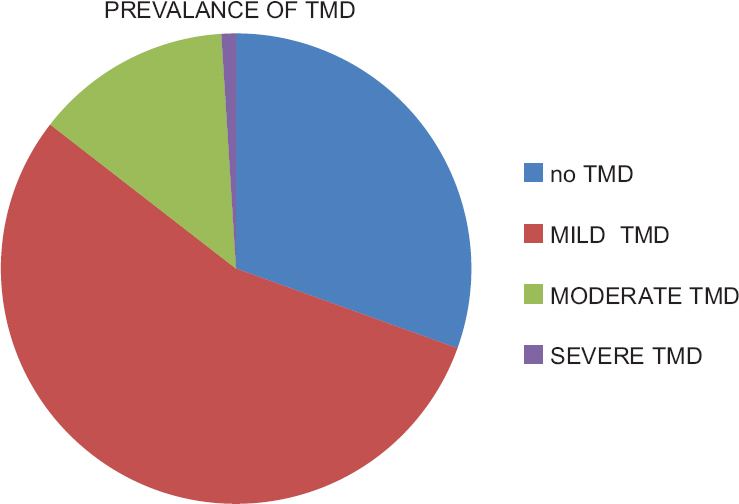 The sum of points was used to classify participants into TMD free, mild TMD, moderate TMD, and severe TMD. Results: Among all the participants examined sixty participants had no TMD (30%), 110 participants had mild TMD (55%); 28 patients had moderate TMD (14%) and two participants had severe TMD (1%). The reliability of Fonseca's questionnaire was found to be 0.603. Conclusion: The Fonseca questionnaire can be used as effective tool in the prevalence of signs and symptoms of TMDs. Public health services should adopt the questionnaire for screening as it will be obtained in a relatively short period and at low cost covering a wide population. Aim: The most common malignancy of the oral cavity is squamous cell carcinoma, which accounts for approximately 5% of all neoplasms. Unfortunately, the great majority of these tumors are diagnosed in stages which require surgery with radio- and chemo-therapy. These treatments affect not only the malignant cells but also the healthy tissues of the patient. Therefore, the present study was conducted to detect oral cytological atypia among oral squamous cell carcinoma patients receiving chemotherapy and/or radiotherapy. 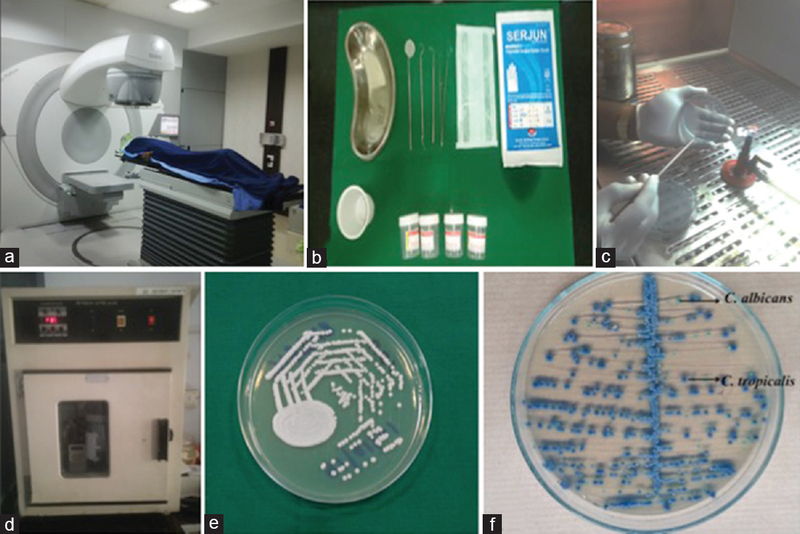 Materials and Methods: Oral buccal mucosal cells were obtained from thirty cancer patients receiving radiotherapy and/or chemotherapy (ascertained as cases) and thirty cancer patients not exposed to either therapy (control) and stained with Papanicolaou stain. Pearson's Chi-square test was used for statistical significance. Results: Oral epithelial atypical features were detected in 28 patients out of 30 patients who received radiotherapy and/or chemotherapy. 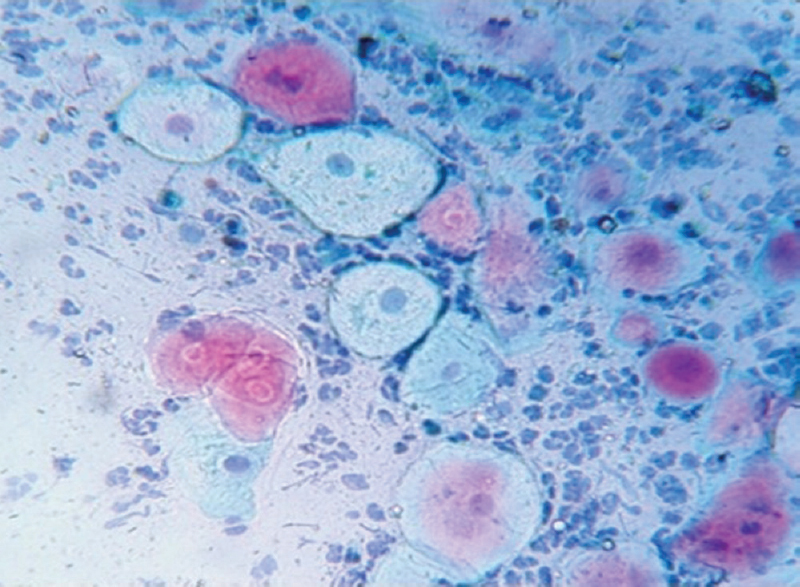 Atypia was not observed in the control group. Inflammatory infiltrate was identified in all the therapy-related cases. Conclusion: Radiotherapy and/or chemotherapy induce variable degrees of atypical cytological changes. Radiotherapy, though a potent tool in cancer management, can unleash the surrounding normal tissues if used without caution. 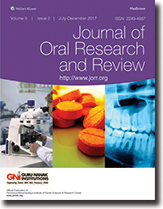 Aim: This study aims to evaluate the efficacy of single application of topical doxycycline hyclate and triamcinolone acetonide only once as a new therapeutic regimen in the management of recurrent aphthous stomatitis for pain reduction. Materials and Methods: A total of 30 patients were included among which 15 patients were taken into each group. 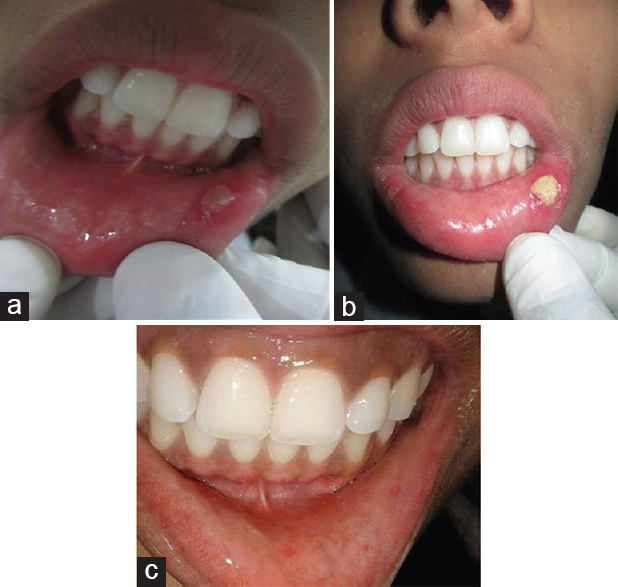 Patients with aphthous ulcer were diagnosed on clinical examination, pain intensity was noted using a visual analog scale (VAS) of 0–10 (with 1 mm division, where “0” is no pain and “10” is worst possible pain), number of ulcers, size of each ulcer, and the duration of each ulcer were recorded. Group I was treated with doxycycline hyclate fine powder mixed in denture adhesive and applied onto the lesion. Group II was treated with 0.1% triamcinolone acetonide gel mixed in denture adhesive and applied onto the lesion. A pain scale sheet was given to each patient to self-evaluate the daily status of pain scale on the day after treatment and daily after that for 7 days. Results: Pain intensity on VAS scale in Group I was 4.27 before treatment and 2.27 after treatment. Similarly, in Group II was 3.60 before treatment and 2.13 after treatment. Pain reduction in VAS-after treatment in 15 Group I patients was 46.8% after treatment on day 1. Moreover, in Group II was 40.8% after treatment on day 1. Group I had faster ulcer healing 2.87 ± 0.743 days when compared to Group II 5.13 ± 0.915 days with the P value of (<0.001). Conclusion: Healing of the ulcer was significantly faster with doxycycline treatment compared to triamcinolone ointment with no adverse effects. Doxycycline is proved to be one of the modalities for the treatment of aphthous ulcer. Patients with special health care needs often present with compromised oral health for which they need dental treatment. Such patients and often their guardians find it difficult to maintain oral health due to various reasons such as decreased manual dexterity and preference for soft diet. Bilirubin encephalopathy is a condition occurring as a result of neonatal jaundice/hyperbilirubinemia. Elevated levels of unconjugated bilirubin at birth often leads to brain damage manifesting as auditory and motor defects such as athetoid cerebral palsy. This paper reports one such case of dental management of a known case of bilirubin encephalopathy. Supernumerary teeth are a rare finding in dental arch, which are mostly reported in association with syndromes. However, they can be seen in the absence of systemic disease. They may be single, multiple, unilateral, or bilateral with a predilection for the mandible, especially in nonsyndromic patients. Due to its different form and position in dental arch, it is observed to be associated with various periodontal problems. 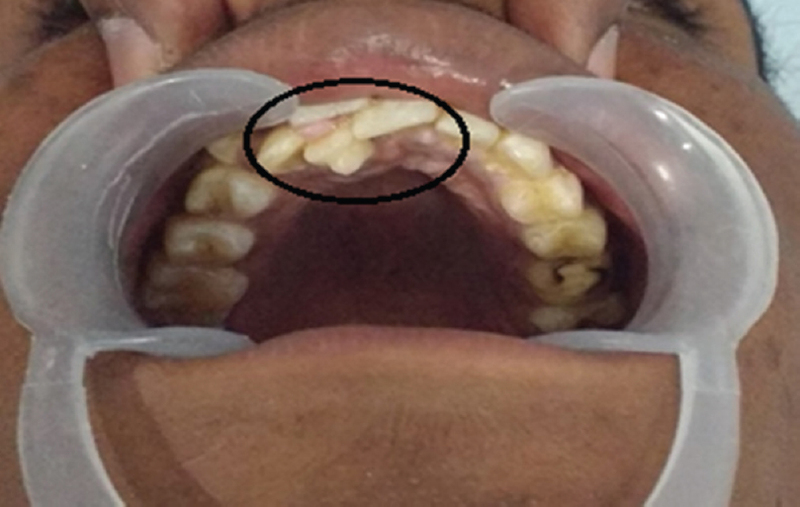 This case report presents a case of bilateral parapremolars in the maxillary arch in a nonsyndromic patient, which led to food lodgment and consequently led to caries and periodontal problem on the left maxillary arch. Talon cusp is an accessory cusp-like structure or an extra cusp on an anterior tooth arising as a result of evagination on the surface of the crown before calcification has occurred. The cusp is composed of normal enamel and dentin containing varying extensions of pulp tissue. It is associated with few developmental anomalies such as peg laterals, dens invaginatus, and mesiodens. Mesiodens is a supernumerary tooth located in the premaxillary central incisor region which is supplemental or rudimentary type. Association of mesiodens with talon cusp is a rare occurrence with 25 cases reported. The presence of Talon cusp or a supernumerary tooth – mesiodens – leads to clinical implications such as poor esthetics, crowding, rotations, and also occlusal discrepancies. In this report, we present a case report of an 18-year-old male having a talon cusp on palatally erupted mesiodens. According to anthropological records, with a reduction in dietary intake of Vitamin D and reduced sun exposure, the prevalence of Vitamin D deficiency is increasing day by day. About 30%–50% of the general adult population has serum Vitamin D levels below the recommended values. 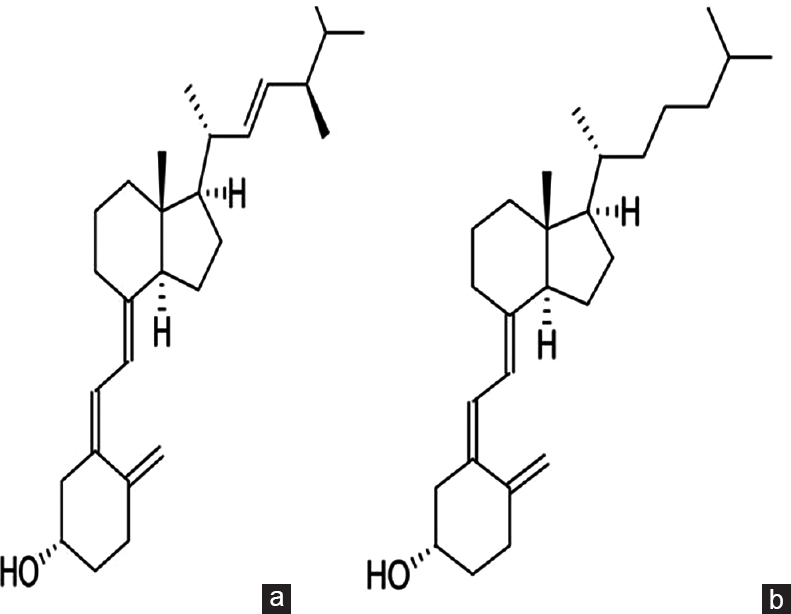 Since its discovery of Vitamin D is always associated with regulation of calcium metabolism. Recently, it has been discovered that Vitamin D plays a role beyond this. Numerous evidences have indicated that the participants with Vitamin D deficiency are at a higher risk of bone loss, but they are also prone to many infectious and chronic inflammatory diseases. Through its effect on bone and mineral metabolism, innate immunity, and several Vitamin D receptor gene polymorphisms, it is now believed that Vitamin D benefits periodontal health and its deficiency is associated with the periodontal disease. This review will examine these actions of Vitamin D, in particular, the role of Vitamin D in periodontal diseases.